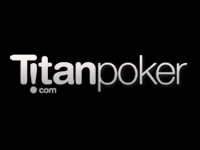 Titan Poker is the premiere poker room on the very popular iPoker Network. 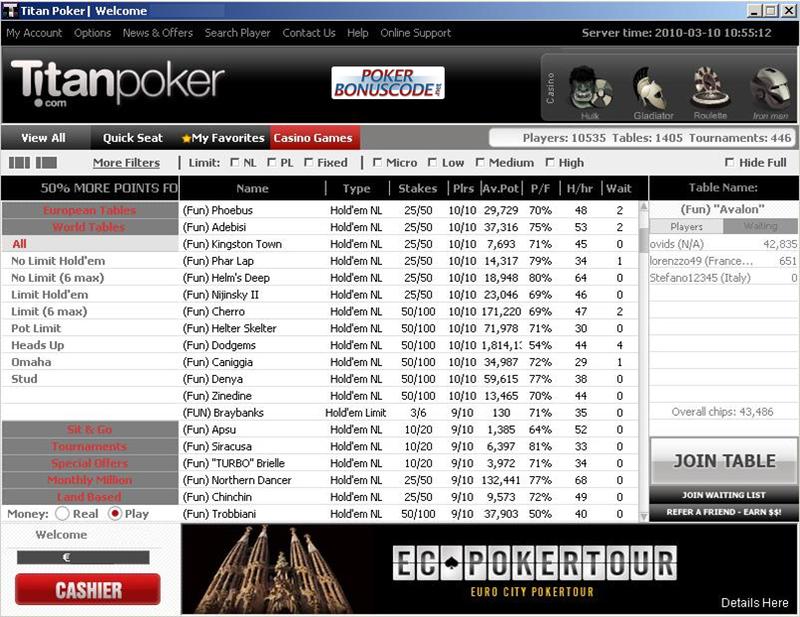 IPoker is the largest poker network in the world and has grown in popularity to rival Party Poker as the third highest traffic poker room on the internet. They have steadily been growing over the years and in particular have seen their traffic take a big jump lately. The reason behind this is said to be the overall quality of Titan Poker and the iPoker Network as an outstanding place to play at. 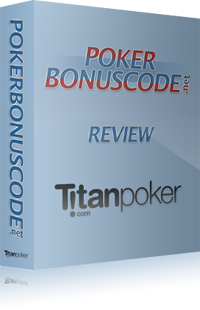 Additionally to my review for Poker Bonus Code, I have created a site completely related to Titan Poker. You can visit this site by clicking on this link (opens in a new window.) There’s a lot more to read about Titan Poker, the software, the games and the promotions. I’ve known the owners of this poker room well before the existence of Titan Poker, as I used to deal with them a few years back when they owned Noble Poker, prior to its being sold to Party Gaming. Noble was a pretty good site back then and I sent them a lot of business recommending it to my students, who all pretty much did very well there. Then they sold it, and started a new poker room called Titan. While this is nothing against Party Gaming, when they took over Noble it lacked the personal touch I was used to seeing there, however the outstanding service and management that I was accustomed to was still available at Titan, as it still is today. This is a very well run poker room and certainly among the very best places to play online poker period. As you will see, they truly have the interests of players in mind, and in particular, don’t take the attitude that you can just offer a run of the mill experience and expect to do well. Instead, they work hard to try to make our experience playing there the best they can make it, and they succeed at doing a very good job here. Now there’s a lot of reasons why you’d want to play at a particular poker room, and reasons far more important than this, but I really like the idea that a poker room cares enough about my business to always try their best to keep it, and this is certainly something that Titan Poker does well. It used to be that most startup poker operations failed, due to the challenges of trying to build up a big enough player base and enough traffic to get players to want to play there. For instance, if you signed up or were looking to sign up at a poker room, and there was no one playing or maybe just a few tables, this would be a big turn-off for most people. So as time went on, almost all of these startup poker rooms failed to catch on, and since it cost money to start them up, many went belly up due to lack of revenue. The ones that did survive did so just barely. Then someone got the idea of having these smaller poker sites team up to share traffic, which now allowed them to start out with just a few players but have them play at a place where there was at least a decent amount of action. This was a huge improvement, and then some busier rooms would join to make things even better. Among these poker networks, the most successful of them is known as the iPoker Network, which features a total of over 30 different poker rooms. Probably the nicest thing about poker networks is that they tend to attract a lot of poker rooms where poker is a sideline to their main offering, and the main site specializes in something else such as sports betting or casino gambling. So you end up seeing a lot of players where poker isn’t their main game and they are just looking for a little action on the side. This is certainly the case with iPoker, as they have traffic coming from several large sports books and online casinos. As poker players, this is a great situation to be in as sites that can tap into these kinds of players tend to be a lot fishier than normal. So what you want to do here is play against a lot of non poker players but do it at a poker site which specializes in poker, so that your chosen poker site understands your needs and is looking to take care of you. On the iPoker Network, no one does this better than Titan Poker, so in this case it’s like you’re getting the best of both worlds with your experience there. Titan Poker has their goal to be the best at everything, and their welcome bonus is no exception. They had been offering a very nice 200% match up to an extra $1000 in bonus cash, however, just having the best offer around wasn‘t good enough. So Titan Poker decided to leave other popular poker sites even more in the dust and has very recently upped their deal to an industry leading 200% up to an additional $2000. As you can see, they don’t mess around, and they want to leave no mistake as far as how far they are willing to go to be a leader in this and all other areas. For comparison, we’ll assume that you have $1000 to deposit. At Poker Stars and Full Tilt Poker, the leading two poker rooms on the internet in terms of traffic, you’d get $600 in bonus money at each site. At Party Poker, which Titan has worked its way into being pretty much tied with in terms of the number three poker site in terms of traffic, you’d get only $500. Titan Poker offers you a full $2000 in free cash for this size of deposit, so you can see how much more generous they are. If you are depositing smaller amounts, you get at least twice as much bonus money at Titan than these other poker sites who only offer 100%. Still though, I want to point out once again that it’s not a matter of just choosing one poker bonus deal over another, as you can cash in on as many as you want, provided that the poker sites you choose to get paid to try out are worthwhile in themselves. There are many poker rooms which aren’t that great and you’d be better off staying away. That’s why you want to stick to our reviews here for both great bonus deals and great poker sites as well, and you really need both. With Titan Poker, you definitely get both, and this may be the best all around deal anywhere when you take everything into consideration. A super sized bonus is one thing, but it’s just as important that it be easy to cash in on. Otherwise, you may not be able to cash in on the whole amount in the time allotted to do so, and with some places, you might not even see any of it. Very few poker rooms make it an all or nothing thing anymore, and things have really improved in this area lately, especially for smaller players. It used to be that if you only made a small deposit, bonus offers were like grapes of wrath, where you didn’t even have a chance of getting them with the stakes you’d play. Now, just about every poker site releases their bonus amounts in increments, meaning that you only need to collect a portion of the points needed However, there is still a significant amount of difference among sites in how much you need to play to release a given bonus amount. Titan Poker claims their bonus is the easiest to free up around, and this does seem to me to be true as well. So the important thing is that at Titan they give you a lot and also give you the best chance to collect a lot. You only need 330 points for every $10 installment, which isn’t that difficult to hit. They pay out the bonuses daily, and give you 90 days to collect it. You probably don’t know what 330 points is, but the bottom line is that even small depositors should be able to collect all the bonus with very little trouble, which is what matters. For starters, Titan Poker runs daily beginners’ freerolls, and you’re considered a beginner as long as you haven’t played there for more than 90 days, so potentially that’s 90 of these that you can play. The prize money for these isn’t that exciting, but they are free, and provide some good multi table tournament experience for players newer to the game, without having to invest anything. The fields for these, as they are for all the new depositor tournaments, are pretty small as you might imagine, so your chances are pretty good to share in the loot. It doesn’t stop there though. By making your first deposit with Titan Poker, you get 4 tokens to some much bigger freerolls, all with prize money of $2500, so that’s $10,000 of free tournament entries that they give you in total to these special tournaments, once again limited to new depositors only. Most sites have first time depositor freerolls, and some do tend to be on the generous side, but when you combine the small amount of players playing in these with the big prize pools, once again Titan Poker really stands out here. Titan Poker has also been known just to give you free tournament tokens here and there, and someone from their support department just contacts you through their live support chat and gives it to you, with no obligation. This is a nice touch and is just another way they show you they value your business. By the way the support here is excellent, with people there 24 hours a day at your beck and call though the live chat, and you don’t have to wait on hold very long at all. If you have a smaller sized bankroll then it’s definitely in your best interests to play the smaller stakes, and one of the big mistakes, a huge one usually, that smaller rolled players make is to play too high for their bankroll. Not only are the players better the higher the stakes, but if you’re not properly bankrolled for the stake, the normal variance, meaning the usual ups and downs of luck that you run into with poker, will very often bust you out. So the first goal if you’re in this boat needs to be to make sure you can handle the normal swings. So that’s one reason to look to play low, at least until you’re ready to play higher. The second reason is that if you’re not good enough to be profitable yet, you’re losing money at playing, so the choice at this point becomes to lose it fast or slow. Slow is obviously the better choice here, as this gives you time to improve your game and turn things around, and if you do indeed need to put more money in, you’ll have had the time to gain some valuable experience in the mean time and will be better prepared. Another benefit of this strategy is that the lower the stakes, the weaker the competition, so you will have an easier chance to be profitable at the lowest of stakes. However, wouldn’t it be better to play against even easier competition than this at these lower stakes? Well Titan Poker makes this a reality for you with their beginner tables. Now you don’t have to be a beginner to play at them, as once again they define beginner as someone who has only been playing at their poker site for 90 days or less. However these tables are chock full of actual beginners, and therefore are a great way to either limit your losses while you learn the game, or pound on people at the fishiest tables you will ever see anywhere. So regardless of your experience, if you are a small stakes player, this is a big benefit and will allow you to really build your bankroll up during the first three months of playing at Titan Poker. You may have heard of poker races where you compete against other players to see who can play the most during a given period, with prizes given out to the top performers. Now players with a smaller bankroll don’t generally have a chance at these, but Titan Poker once again goes the extra mile to make sure everyone is well taken care of. So they have weekly beginners races, where players who once again have only been playing for less than 90 days can compete, and the competition is limited to these players. The more raked hands you play at the beginner tables, the higher you climb. The prize pool is $500 per week, and you can compete in them each week that you have your beginner status, which adds up to 13 weeks of additional fun and prizes. The top 100 people each week get awarded prize money, and there really aren’t that many beginners at the site, so your chances are certainly good to cash in here. They track your progress, and you can watch yourself climb the leader board as you play more and more there, which is a lot of fun. I just had a look at last week’s leader board and you really don’t have to play all that much to get paid with this, and is especially nice if you have a small roll and could really use the extra loot you can make. This is actually one of the most exciting things that Titan Poker offers its new players. Now I’ve seen a very few poker sites offering free poker software, but they generally are only useful to true beginners. Titan’s Poker Mentor is a high quality odds calculator though, and similar to what you have to pay $50 or more to buy. They give it to you absolutely free though. This tool allows players to take advantage of poker math and develop their understanding of the game. Knowing the odds and what your chances are of winning a hand is one of the big things that really separates good poker players from less skilled ones, and Titan’s Poker Mentor will give you a real head start here. It automatically scans your cards and also takes into account your position and the playing styles of your opponents, and displays the odds for you. It will even make recommendations for you as to what to do with your hand. Now this won’t make you ready to take on the world’s best players by any means, but it’s not only a fabulous educational tool for newer players, but even experienced and winning players will appreciate the convenience of having this work out the math for you in every hand you play. This program is definitely one of the best software packages out there of its kind at any price, and once again you get it absolutely free. Titan Poker Guru is an interactive teaching tool which provides users with a variety of poker tips, including the basics for those new to poker, to beginners strategy, to advanced strategy lessons. The basics and the beginners stuff is more directed to players who don’t know what they are doing yet, but many players will find the advanced section helpful, where they cover such topics as bankroll management, blind stealing, bluffing, calculating odds, and more. As I’ve mentioned, the traffic at Titan Poker is excellent, and is consistently ranked among the top 3 or 4 busiest poker rooms in the world. It’s not just the amount of traffic that a poker room has though. You want at least a decent amount though and Titan has way more traffic than this. Due to their attracting players from around the world, there is a lot going on there at any time of day or night. At the time that I’m writing this, it’s perhaps the slowest time of the day, yet there are still about 4500 players online, which is quite a lot for any time of day. In fact, if you’re looking for more traffic, there’s really only two poker rooms which can give it to you, and both feature much tougher competition. It obviously doesn’t do you a lot of good to have more tables to choose from but none of them are very good in terms of your profitability. There’s nothing more important than softness of completion, as this directly affects how well you do. Titan Poker’s combination of its loads of traffic combined with its loads of fish, especially with all of the gamblers who don’t know much about what they are doing, scores them the highest marks in this crucial category. Most poker rooms have frequent player reward programs, and some are better than others, but the program here at Titan Poker, as is the case with pretty much everything about this poker room, is outstanding. They have several levels you can climb, and the higher level you are at, the more points you get per hand or tournament, which is all pretty standard. What separates Titan Poker’s VIP program is the level of rewards that you get for a given amount of play, and it’s very generous. You can redeem your points either for cash right into your account or for free entries to tournaments which otherwise cost money to play in. The payout levels range from just $5, meaning that you don’t have to wait to cash in if you don’t want to, all the way up to a whopping $120,000 for bigger players. The only thing you need to know here is that the more you play, the more you earn, and you’ll get much more generous helpings of cash than is typical in the business. Titan Poker’s scheduled tournaments offer a guaranteed minimum of $16 million in prize money every month, which is a crazy amount of cash to be giving away. So needless to say there’s always lots going on here. The best thing about the Titan Poker tournaments is how soft the competition is at them. There’s no question in my mind that they are the softest anywhere, and it’s not even that close. If you like to play tournaments, this is the place to play them at, bar none. If you don’t generally play them, then I strongly encourage you to give Titan’s a try. The big tournament here is their weekly $200,000 guaranteed, where you can buy in directly to it for $200 +$15, or you can win a seat to it much more cheaply by playing in one of their many satellite tournaments designed to suit every budget no matter how large or small, starting at just $5. There are also a lot of other tournaments with big prize money that you can play here, unlike a lot of poker sites which just have one big one and a lot of smaller ones. They also feature a very good selection of opportunities to play in huge live events, such as the World Series of Poker, the Aussie Millions, the Irish Open, and more. Of course, there are also plenty of smaller tournaments running all the time, so players who enjoy the additional excitement and entertainment of scheduled tournaments will find themselves immersed in tournament heaven, especially when you consider how easy it is to do well at the ones that run here. If you like to play sit and go tournaments, the ones at Titan Poker are also excellent. They offer a full range of formats, and as is the case with the play here generally, the competition is nice and soft, meaning a higher win rate for you and more money in your pocket, which is what really counts of course. They even have huge jackpot sit and go’s where you can string together a few wins to collect some very big prize money. For instance, at the Fort Knox tables, in addition to the regular prize money that you win at them, if you win 6 in a row, you win a minimum of $50,000 in extra money. That’s some serious extra bread. Once again, Titan Poker stands out from the crowd and offers a vast array of methods to get your money in and out of their poker room. This is a sore point with a lot of poker sites, especially when it comes to the limited amount of methods that they allow you to cash out with. No one wants to wait several weeks for a check to come in the mail. At Titan, they offer over 40 different ways to deposit with them, and 20 methods that can be used to cash out your winnings. There isn’t even anyone close to offering such a good selection, and they will even allow you to deposit and withdrawal right from your bank account if you wish. I’ve used their methods for years and it started out very good and has just gotten better and easier over the years, although I don’t think it’s possible to get any easier than what they have going now. I absolutely love this poker room as you can probably tell. I definitely give it 5 stars out of 5. I’ve been playing at Titan since they opened the place and have also been strongly recommending it to my students and I haven’t heard of a single person who wasn’t very pleased with it. So given that they are looking to pay you the highest bonus in the industry to try it out, you’d be crazy not to take advantage of this deal. Make sure you use our Titan Poker coupon code “PBC2000” to get the 200% match up to $2000, then click on our special link, sign up, throw as much money as you can afford to in here, and go to town. If you’ve never had an account at Titan Poker before, we’ve got some great news for you. There’s never been a better time to try out this top recommended poker site, and we’ve lined up a great deal overall for you to get rewarded for doing so. Not only do they have an industry leading 200% match of your initial deposit up to an extra $2000, there are several new depositor freerolls that you can enter, a special beginners section where only new depositors are allowed to play at the tables, a beginner race where you’re just competing against other new players for some nice extra cash, and more. Here at PokerBonusCode.net, we’ve lined up the best deals around for trying out new poker sites, including top bonuses and more. This is certainly no different with the Titan Poker bonus code and deal we have for you. To take advantage of everything this deal has to offer, you’ll need to enter in our special bonus code when you register with them, which is “PBC2000”. So write this down as you’ll need it once you finish reading this and then click on our link to Titan Poker so you can lock in this deal. Most poker sites will only match your deposit, meaning that for every dollar you deposit initially with them, you get a dollar in bonus money. Titan Poker doubles this deal, where they give you 2 dollars for every dollar you deposit. Naturally, you want to deposit as much as you can, and if you can put in $1000 you will get their full bonus payout of $2000. Not many players can start out this high though, so don’t worry if you don’t have that much to put in, as this is a sweet deal even for smaller depositors. If you have poker money at other sites though, it’s time to round it all up and throw it in here. Even if you don’t have anything to deposit right now, you still should register with them through our special link and lock in this bonus deal with our Titan Poker bonus code. I see bonus deals change all the time, and often poker sites offer limited time special deals, but don’t tell anyone how long they are running for. So you don’t want to procrastinate here and I’ve seen players wait and then end up being sorry and have to settle for hundreds of dollars less in bonus money. Bonus deals are a fantastic way to build up your bankroll, and we have many great ones available for your benefit here at PokerBonusCode.net. This isn’t a matter of picking one deal and going with it, it is more of a bonus tour, where you try out multiple poker sites and get rewarded handsomely multiple times. There is literally many thousands of dollars of free money out there waiting for you to collect it. The deal here at Titan Poker is just one of several we have for you, but it’s definitely one of the better ones and is one everyone should look to take advantage of. By the way, in spite of whatever bonus offers a poker site has for you, it’s still important to stick to the better poker sites, as it does you no good to collect bonus money and then lose it back and your own money as well at a poker site that’s too tough to win money at. So that is why I only recommend the best ones for you, where the expectation is that you’ll make a profit at the tables in addition to the free poker money they have in store for you for trying them out. Freerolls are generally a waste of time if they are open to everyone, although free tournaments where the field is limited can be very lucrative. What you want to do in order to figure out how worthwhile these tournaments are is to take the prize money and divide it by the number of entrants. For instance, if it’s a $50 freeroll and there are 20,000 participants, your expected value for playing is about a third of a cent. If you spend an hour on average playing them, that’s a third of a cent an hour. If you played these for 40 hours a week for a full year, as a full time job we’ll say, then you’d have an annual income of about 5 bucks. So it’s not hard to see that these are a complete waste of time money wise, although they do provide players with real experience where opponents are playing like they care about the outcomes, unlike play money tables where they don’t. However, it’s preferable to play actual real money poker, and even the smallest of stakes provide you with both genuine competition and the opportunity to make some real money and work on moving up to playing higher and higher stakes as you improve and your bankroll grows. Needless to say, getting a boatload of bonus money along the way, as we recommend you do, will make a huge difference. So unless you’re dead broke and don’t even have $20 to throw in, I don’t recommend freerolls in general. On the other hand, the no deposit freerolls that Titan Poker has for you are a completely different story. You get a free ticket to a total of four $2,500 freerolls, and the only people who will be joining you are recent first time depositors like yourself. So that’s a total of $10,000 in free poker tournament entries, and unlike regular freerolls, your chances of cashing in on some real nice loot here are very good. I deposited at Titan way back when they opened the room a few years ago, so I can’t get in on these, but I sure wish I could. You can though. Whether you actually are a beginner, or just like beating the crap out of beginners to build up your bankroll, Titan Poker has set aside a section of tables and tournaments limited to those who have made their first deposit within the last 90 days. These tables are frequented by the biggest fish you’ll ever see at a poker table, and almost all of them are true beginners. One of the real pitfalls with newer players starting out or just learning the game is that they are faced with playing against much more experienced players. Now Titan Poker is one of the fishiest poker sites out there, but the fish tend to be experienced, and if you’re not, well you probably have some learning to do before you can beat them. So players will typically lose a fair bit of money as they learn, working their skills up to the point where they can start to win more than they lose and become profitable at the smallest stakes a poker site offers. So if you can play against fellow beginners for a full 90 days without even having to worry about playing against more experienced people, then that’s a huge advantage to you. Then, when the time comes, you’ll be much more ready to play against the general population so to speak. By the way, the experience of the overwhelming majority of the players at Titan Poker is limited to the experience of their losing money. However, given the choice, if you’re looking to play the smaller stakes that they have beginners’ tables running at, this becomes a no brainer no matter how experienced and skilled you may be. You’ll definitely be doing a lot better against these newbies regardless. Each week Titan Poker gives away a prize pool of $500 where all of their players who have made their first deposit in the last 90 days and are therefore eligible to play the beginners’ tables compete against each other in a points race. The more hands and tournaments you play, the more points you collect, the more you move up the rankings, and the better your share of the prize money is. This competition only includes play at the beginners tables and tournaments. So this is yet another good reason to try out Titan Poker and cash in on all the goodies they have for you. It’s also a lot of fun competing for this money and looking to outdo your opponents not only at the tables, but at the points race competition as well. Sign up at Titan Poker and make your first deposit and we’ve also arranged for them to give you a copy of the Titan Poker Mentor calculator. This is similar to software you have to pay $50 or more to buy, and instantly displays poker odds for you as you play on their poker site. This is not only a great educational tool for newer players, but this information is handy to have right at your side even if you’re an experienced player, and will have you playing even better and winning more money. This valuable tool not only takes into account your odds of winning the hand, it also takes position into account, the styles of your opponents, and more. It even makes recommendations for you based upon the information it’s gathered. It’s almost like cheating, but it’s an advantage that Titan Poker not only approves of you using, they give it to you, and at no charge. If you don’t fully appreciate how great this tool is, you will once you start using it. When you take everything into account, the outstanding 200% bonus money up to an additional $200, $10,000 worth of valuable freerolls, the beginners section, the beginners’ race competition, and the free poker software, this might be the best deal anywhere to try out a poker site. This is true for new and old players alike, but it’s especially nice for newer ones. Regardless of where your game is at though, it’s easy to see how you really owe it to yourself to try out this poker site. It also happens to be one of the very best places to play poker on the internet period, not even counting any of these bonuses. So now is the time to lock in all of these deals by visiting their site through our link and entering in our Titan Poker bonus code 2018 of “PBC2000” when you register. I’ve played at pretty much every poker site and also have had a lot of students over the years, as well as a ton of people that I’ve been recommending poker rooms to that I get a chance to talk to, and from my experience and the experience of countless others, I really do feel that Titan Poker’s tournament play is the best overall anywhere. What I look at most in deciding these things is how easy it is to do well in tournaments at a given poker site. Now most poker rooms have soft games at the lowest stakes or buy-in levels, so that’s not what I’m talking about here. What I really want to see is a soft group of tournament players overall, especially if they are willing to give you some strategic edges beyond their normal weak play. 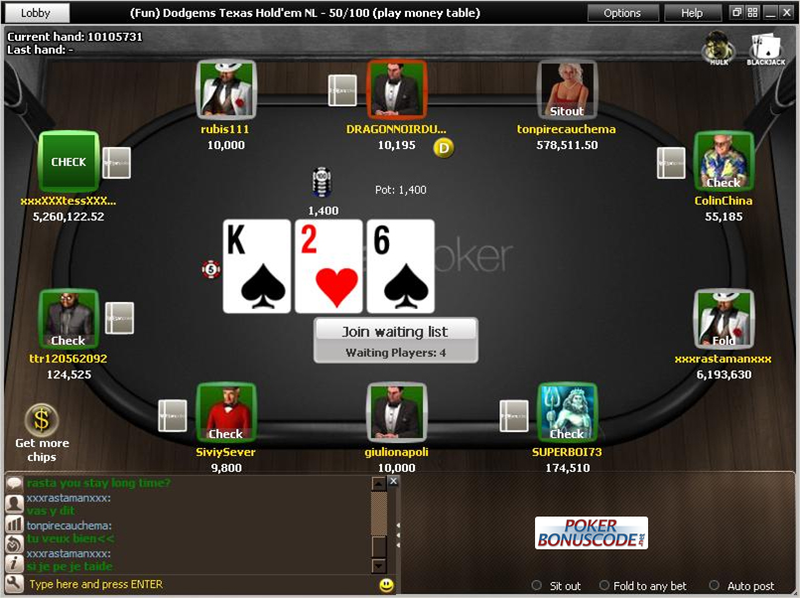 For instance, at just about every other site, most players will rebuy and add on in a rebuy tournament. This is because it is good strategy to do so. The more people don’t tend to do this at a poker site, the juicier the tournaments will be, since it’s a mistake for them not to, and this creates a lot of dead money in the prize pool. So this is one of the things that you see at Titan Poker. There’s a high percentage of people who make these mistakes, and that alone is a plus, although it’s indicative of a lack of understanding of the game overall as well. Simply put, the tournament players at Titan are the worst on the internet, hands down. So this is something that you need to put a lot of stock in as well. Think of it this way. Your skill level is a constant. So whatever that happens to be, it has absolutely no bearing on the tournaments that you choose, other than perhaps looking to choose more difficult ones to play against better competition and look to improve. Aside from that, what we generally want to do is to give ourselves the best opportunity to do well. Now our preferred stake level may dictate this somewhat, but unless you need to play the uppermost stakes, you’ll be able to choose from pretty much any poker site you want. So your skill level is what it is, and it’s going to be the same right now no matter where you play of course. However, the average skill level of each site will tend to vary quite a bit. Now a lot of players don’t really appreciate these differences, and think that a $20 buy in tournament features pretty similar competition regardless of the poker site. This is absolutely not true, and in fact there is a big difference between the toughest and easiest sites. So your expectation, whether positive or negative, is the difference between your skill level and the average skill level of whatever game you’re looking to play. So for instance if you’re skill is a 5 out of 10, with 10 being an expert and 1 being a complete newbie, and you’re looking to play in a tournament where the average skill level is 7, then your expectation is minus 2. If you instead choose a tournament where the average skill level is a 3, your expectation is now plus 2. So you can see that this can and does make a big difference to your results. Still though, people wonder if there really is such a big difference in average skill levels. I can tell you with certainty that there is. For example, I play higher stakes heads up sit n’ go’s primarily, and I wisely choose to play at the softest poker rooms. I play anywhere from $100 to $500 buy in levels. So I was reviewing one of the tougher sites and I decided to play some low stakes ones there, and after playing a few, to get a feel for the competition for a review, I found that these low stakes players were actually pretty comparable in skill level to the people I usually play at the highest stakes at these easier sites. I still won, but I couldn’t believe how good these players were at this new player buy-in. The players at this level weren’t new at all though and I could tell that they had a pretty significant poker education. Now compared to the people at Titan, there are a few good players who play these there, but most are fish, at any level. As you move up, they do tend to be a little less fishy but not by that much. This is the case at all the tournaments they have there, and especially at the bigger scheduled ones. I play tournaments mostly at Titan for this reason. This all is a huge deal. So in starting to talk about all the various tournaments that are available at Titan Poker, I want to talk about the ones that they offer you as soon as you make your first deposit with them. They give you 4 tokens, each good for an entry into one of their $2500 new depositors freerolls. As the name of them suggests, they are free and they are for new depositors only, which keeps the amount of players playing in them very low relatively speaking and thus significantly increases your chances of making some real money here. These tokens are pretty valuable as a matter of fact and I’d love to have some of them myself, but I’m not eligible. You are though. They also run smaller twice daily new depositor freerolls which you can enter for a full three months after your first deposit. They are a nice way for players with smaller sized bankrolls to look to make a little extra money and also gain some good experience playing multi-table tournaments. As I’m writing this, there’s one of these going on and it’s down to the final 6, so I brought up the table to have a peek for you. Some clown called an all in shove pre-flop with 95s, maybe he thought because it was suited this was a good move. He quickly exited. The other 5 players don’t look much better. If you have a clue at all you’ll probably do real well at these. Titan Poker also offers regular VIP freerolls where the higher your VIP status, the bigger the prize pool. These are also very nice and are well worth the time regardless of how high a player you are, as the smaller fields provide players with a nice amount of expected value, which you get when you take the prize pool and divide by the amount of players. As is the case with the big new depositor freerolls, these tournaments also feature big prize money and not a lot of players to split it up among. There’s not a ton of action at Titan with sit n’go tournaments compared to the busiest poker sites, but what they do have is certainly excellent. It’s no trouble getting in one at your desired format and buy-in at the smaller stakes at any time of the day or night. At the mid buy in levels and higher things do tend to drop off somewhat during the off peak hours, meaning the middle of the night in Europe, but it’s not like there’s nothing going on either. For instance, right now it’s definitely off peak, and there’s tons of smaller buy-ins, a decent amount of mid stakes, and even some high stakes. A lof of sites have things dry up pretty much completely in the wee hours, but Titan isn’t one of them. There aren’t dozens of tournaments running at your game either, but you don’t need that. I highly recommend the Sit N’Go’s at Titan and even if you’re a losing player elsewhere you’ll probably find yourself making a profit at these. I once did a project where I was looking to demonstrate that you could build up a good sized bankroll from just $20 there playing Sit N’Go’s and I worked it up to a couple thousand restively quickly without any trouble. Now keep in mind that I’m an expert player but I can tell you that from doing this, I got a chance to check out the smaller stakes personally and they are fishy indeed. The same is true all the way up, relatively speaking of course, as the higher the stake, the better the players tend to be, but at Titan, we’re talking better fish, but they are still pretty much fish. Titan Poker also runs several jackpot Sit N’Go formats, where if you can string together a few wins in a row you can win up to $50,000 in extra money, and that’s on top of what you win from playing them. Obviously this isn’t that easy to do, but people do win these large jackpots, and if there’s a place where you can win several in a row, this is the place. The scheduled tournaments at Titan are certainly the most exciting part of this poker site. Regular tournaments run day and night, and if anything, the ones in the middle of the night tend to be even better, with smaller and even fishier fields. I can’t tell you how easier these tournaments are to do well at than just about any other poker site. Actually I do have a story from a few years ago, back when I started coaching. So I had 2 regular students who I was working with at the time, I got them playing really well, and one of them ended up opening an account at a site on this network. So he plays in a WSOP tournament with a few thousand other people and the winner gets a seat at the main event, worth $14K. So he wins the thing. So my other student gives it a try, plays just one of these as well, and he wins too. So they get me to play one, and I win as well. So we all got to go, pretty amazing stuff. Now this was back in 2005 but I can tell you that nothing really has changed, and the players are still really bad. I’ve played in a lot more of them since then, and over the years I’ve done much better at Titan than anywhere else. The bottom line is that no matter your skill level, you’re going to do better here. The featured tournament here is the $200K guaranteed weekly tournament, and while this does attract some pros, it also attracts a lot of dead money as well. You can buy in directly for $200 + $15, or if you have less to spend, you can win a seat to it though one of their many satellites, with buy ins starting at $5, and you can even use your VIP points to enter if you have enough of them. There are all kinds of other tournaments here as well, amounting to a total of $16 million worth every month. Whether you play large or small, or anything in between, there’s lots and lots of scheduled tournaments for you. If you didn’t need to ever sleep, you could play them 24 hours a day 7 days a week in fact, and always find something to suit your fancy to play. They also feature satellite tournaments to several large land based poker events, such as the World Series of Poker, the Aussie Millions, and the Irish Open. I can tell you for sure that your chances of winning a seat at one of these big tournaments are higher here than at other poker sites. If you’ve never played at one of these, which I assume most of you haven’t, take it from me, there’s nothing like it. Titan Poker may very well let your dreams become a reality, as they’ve done for many players in the past. If you enjoy poker tournaments, as I do, this is the place to play them. I can’t put it any simpler than that. There’s a lot of other great things that Titan Poker has going for them, but the tournaments there really do stand out. All you need to do in order to get started is click on our special link to them, and enter in our bonus code “PBC2000”, and they will welcome you with the biggest bonus in all of poker. See you there.